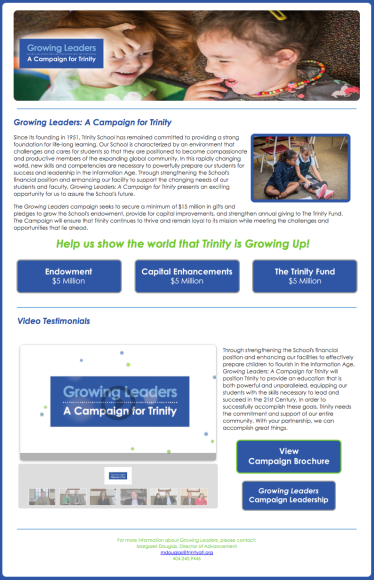 When Trinity School announced the public phase of its capital campaign, it became one of my biggest projects for that school year, as I was charged with designing the microsite and producing the testimonial videos. I created the site from scratch in Dreamweaver using a cascading style sheet, and I created every graphic and button featured on the site. As most sites do, it went through quite a few revisions before officially launching. Most of these revisions were due to my own critiques and tweaks, but of course, the head of our department had some suggestions throughout the process. One was to incorporate some of the elements of the campaign brochure, but as is fairly typical in this industry, she wasn’t exactly sure what she wanted. In fact, after reading her initial email, I thought she was suggesting that the entire design of the site should change to match that of the brochure; thankfully, that wasn’t the case. So based on her explanation, I created these basic graphics (below) for each page of the corresponding campaign priority (Endowment = “Healthy Roots” – Enhancements = “Room to Grow” – The Trinity Fund = “Plenty of Sunshine”). Nothing too fancy, but I wanted to include those phrases (which are very creative! Major kudos to Mindpower Inc.) and I thought adding “flourish” in the background was a nice touch. The most advanced component that I implemented is the video slider at the bottom of the home page. The coding for this was pretty complex, because I had to contend with the slider in the site’s header, which was important to me; I really wanted transitioning photos as opposed to a static header. So making those two work together took hours. Finally, I included an intro for each of the video testimonials, but unfortunately, it was suggested that the look and feel of it was too much of a disconnect from the look and feel of our brand. I don’t necessarily agree, and personally, I loved it (more than I like the one in the final versions) so I kept it for my own “blog-folio” (below). The first clip shows my preference; I love the ribbons and the way it all (music, motion, graphics) makes it look like the launching of a campaign, like something truly exciting is being announced.